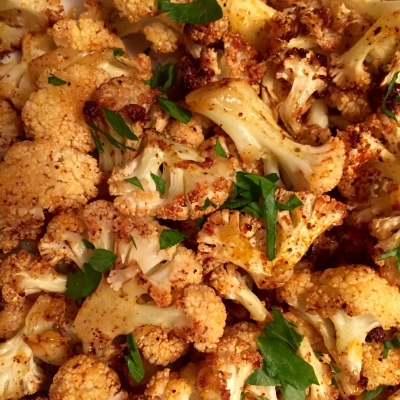 Cauliflower is one of my favorite vegetables to roast. It’s so versatile; you can serve it for an appetizer, side dish, or toss in a salad. Besides the delectable savory taste, cauliflower is a member of the cruciferous family of vegetables which helps prevent cancer and cardiovascular disease. It is anti-inflammatory and antioxidant-rich for strengthening the immune system and improving brain health. Melt coconut oil in saucepan. Cut up cauliflower into small florets. Toss cauliflower with coconut oil in a bowl and then spread on baking sheet. Roast for about 20 minutes, check and then toss cauliflower on the baking sheet and cook for additional 10 - 20 minutes or until desired amount of browning and tenderness.